Whether it’s your wedding or you are a bridesmaid, makeup artists are always life saviours. They fake that J.Lo glow, they transform you into Rapunzel on even bad hair days and they keep you relaxed as you get ready! 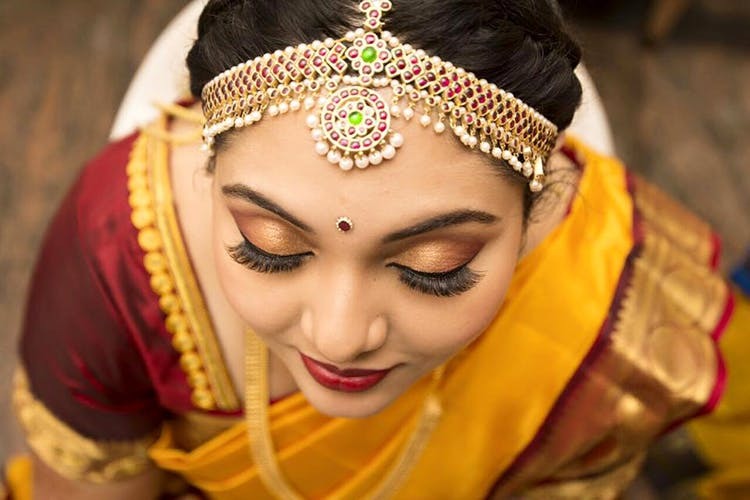 I was scouring a list of bridal makeup artists in Bangalore who are the best in their skills and business in Bangalore, and here is who I think should be on your speed dial! If a celebrity MUA makes you feel at home, Gouri is your best pick! She has worked extensively with Deepika Padukone, Sonali Bendre and Yana Gupta in Bollywood. We know than better to judge Deepika’s beauty sense! They believe in making your natural beauty shine. The natural character of your skin and hair is taken into consideration when formulating the perfect styling for skin and hair! Isn’t that every bride’s dream? Price: INR 15,000 for bridal. This maestro is a unanimous favourite. Her vision is very clear as to what look you are dreaming of and what she is going to deliver. For something as vital as makeup on your D-day, we believe that those skills get extra brownie points! Whether you are a Gujarati bride or a Christian one, Anu gets all the bridal looks right! Not only does she do bridal makeup but her services range from doing the bridesmaids’ makeup to even stunning party looks. Don’t forget she offers airbrush on extra charges too! MUA Saviona believes that a bride’s makeup doesn’t only have to be beautiful but should also make her feel beautiful — because that is what matters on the wedding day. Along with amazing makeup techniques, she uses only top notch products such as MAC, Bobbi Brown, Nars, and YSL in her beauty arsenal. So you are rest assured that your skin is in good hands! A well-known name in the world of fashion, Ralph Daneils is one of the most sought after MUAs in Bangalore. His dislike for heavy makeup is well known and he prefers to have his brides flawlessly glow and shine with his superb makeup skills! Eyes are the windows to your soul they say and Lekha loves to pay up that feature a lot! Her aim is to accentuate the individual’s natural beauty rather than cake you up. She understands your expectations from her very well and delivers that from the first brush stroke. A flawless face and an expression of who you are is makeup for Pragna. A MUA that follows this philosophy gets extra points on our wedding list. This makeup genius is known to customise looks according to what you want and your event. Book her already?